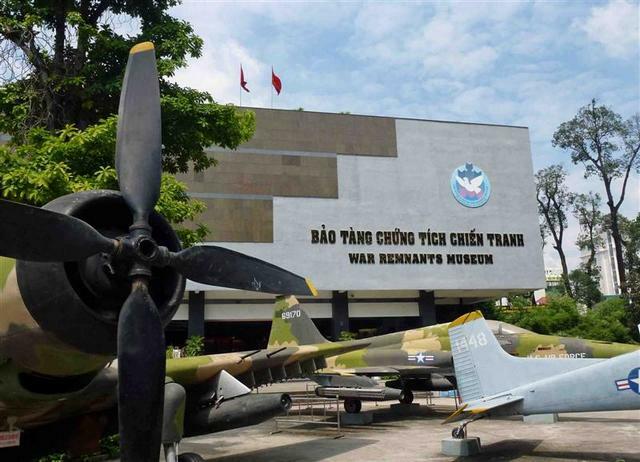 The War Remnants Museum is located at 28 Vo Van Tan St, District 3, Ho Chi Minh City. Operated by the government, the museum was opened in September 1975 as “The House for Displaying War Crimes of American Imperialism and the Puppet Government”, focusing on exhibits relating to the American phase of the Vietnam War. Since then, it has undergone many changes and renovations due to the process of normalization of relation between Vietnam and the United States, such as the change to its current name in 1993. Vietnamese Wars possibly the only thing in mind of foreigners before coming to this nation. Though the country has changed itself and the prejudice has somehow been replaced by a new modern developing image, it’s crucial for tourists to look at the war from a different perspective. And this famous museum is where they can transform an ordinary visit to an intellectual yet remarkable trip. Nowadays, the museum functions as a place to display devastation of the war between 2 countries from 1961 to 1975. It comprises several buildings storing military equipment, as well as disturbing photographs about the traumatizing consequences of Agent Orange, napalm and phosphorus bombs. There are also pictures about atrocities such as My Lai massacre, a guillotine used by Southern Government of Vietnam. In addition, last but not least three jars of deformed human features indicating haunting effects of the war on the next generations. A number of unexploded ordnances are stored in the corner of the yard, seemingly with their charges removed. Not only does the museum illustrate a phase of painful history, but it also tells unknown stories about war to people, especially to Westerners. Many preceding travelers have failed to hold their tears in front of the pictures here. If you are interested in the history of the Vietnam War, do not ever forget to pay a visit to this museum. Many preceding travelers have failed to hold their tears in front of the pictures from the past. Feel it yourself.